Global Volunteers received this letter from Don Maher III, who has served on 10 programs since 2006 in Mexico, Romania, Italy, China, Tanzania, Costa Rica, India, Vietnam and Poland. Do you want to be a traveler or a tourist in life? That is, do you want to actively participate in life, being part of it, feeling the satisfaction of being challenged and succeeding, of helping others and seeing their growth as they find happiness in growing new wings? Or, are you content to just sit back as a tourist and watch life go by, snapping a few photos to remember your vacations? With Global Volunteers, I have found that you can be a traveler and do a little sight-seeing as well. You can meet new friends with like goals as you join new teams at the various Global Volunteer locations for two or three week sessions. You can pick where you want to go. Don teaches conversational English to two young Polish students. At a friend’s invitation, I went on my first Global trip, and found it so exciting and challenging that I’ve gone every year since. I’ve served in nine different countries so far and teaching conversational English to a large cross-section of the world’s population – ranging from young kids to teens to adults to host nation English teachers. It was usually challenging, since I am an engineer and not particularly comfortable with teaching, but the interaction with both staff and students and their great enthusiasm at having us there has been reward in itself. The Global Volunteers country managers/team leaders and other team members are always there to help you. All the students have learned basic English in school, but need help in pronunciation, grammar and in carrying on a conversation. I was amazed in Romania at the advanced grasp of English by the teens, who had honed their skills with American movies, internet, etc. Some spoke with almost perfect American English. At another location, we helped with construction (e.g. laying in 220 volt cable, painting, etc.) in the mornings and helping the local people practice conversational English in the afternoons. Since the teachers in many countries were primarily women, the students, both boys and girls, seemed to really appreciate male role models in the classroom. There is great satisfaction in seeing the youth grow in confidence in speaking English after only two or three weeks with the Global team members. They ask all sorts of things about the U.S. from technology, sports, entertainment figures, jobs, fads, …and, of course, political views. At one location, since a newly recruited math teacher had not yet arrived, I was asked to teach high school algebra and trigonometry. Being an engineer, I was happy to oblige. Thank you so much Don. You truly make a difference! Don Maher with his Polish English conversation students. 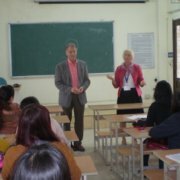 Don teaches an English phrase to a blind Vietnamese student at “Blind Link”. Don planning a mathematics lesson for his Tanzanian students! "Look mom! That’s my hand!"